11, "Nyamo" We get to see more of P.E. teacher Minamo Kurosawa, a.k.a. "Nyamo," esp. her relationship with Yukari. 12, "Factional Rivalry" Envious over Nyamo's unmatched popularity with the students, Yukari shanghais the girls into basketball game. Only, Yukari doesn't play fair... 13, "Yukari's Here" When Yukari visits Nyamo at home, we get to see just how dysfunctional their relationship can be. 14, "Not My Fault" Yukari and Nyamo go out for a drink and end up running into *gasp* a foreigner! Meanwhile, Tomo, Yomi, and Osaka end up sharing in a little philosophy. 15, "Forever And Ever" Yukari shows her wild(er) side while knocking back glasses of sake, much to Nyamo's shagrin. 101 - Anticipation The class is going on a trip to Okinawa, and everyone's excited, especially Chiyo! 102 - Can't Stand Still The girls take in the sights on Okinawa, then head to the hotel buffet to chow down on some champloo(pl.). 103 - Watery Grave Yukari and the girls go scuba diving together. 104 - Island of Dreams The girls head to Iriomote Island, home of the famous iriomote wild cats... 105 - Sakaki finally gets the cat she's always wanted... The question is, will she be able to say "goodbye?" 106 - It's Nice Osaka admires Kagura's summer tan. Also, the girls plan another trip to Chiyo's beach house. 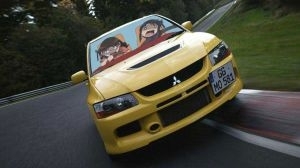 Plus, Sakaki and Kaorin risk death as the Yukari-mobile returns! 107 - Fooled The girls have some fun on the beach before getting down to studying. 108 - Miss Kurosawa Night falls, and the girls hit the books, sort of. Plus, Nyamo faces her bete noire, much to Yukari's delight. 109 - An Attempt Kaorin tries to capture the elusive Sakaki-chan on camera. Plus, Osaka wakes Yukari. 110 - It's Not Over Yet School is back in session. The girls' minds? Not so much. 111 - Got a Bite The Sports Fest returns! 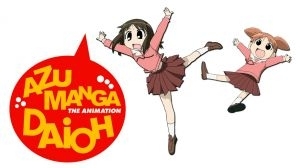 ...But why is Osaka so excited? 112 - Motivator Her and Tomo's rough-housing leads to a crisis for Kagura. 113 - Hadn't Thought of That Osaka is pumped up and ready, but there is one possibility she hadn't considered... 114 - We'll All Run Together Kaorin gets to see Sakaki in a way she's never seen her before. Plus, the relay race begins. 115 - United It all comes down to this... In the relay race, the girls are going to have to work together if they're going to win. 116 - Career Paths When Sakaki reads that a Yamamaya (or Iriomote wild cat) was killed by a car, she has a horrible feeling. 117 - Showdown Sakaki decides that she wants to go away to veterinary school. 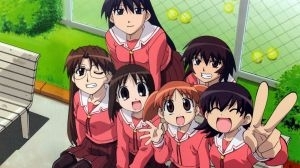 Plus, Sakaki and Chiyo face a group of angry cats, when they are saved by an old friend of Sakaki's. 118 - Let's Go Quickly Apparently weakened after his battle with Kamineko, Sakaki and Chiyo rush the Yamamayaa to the vet. 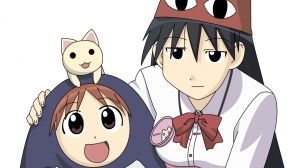 119 - Popularity The girls visit Chiyo's house to see Mayaa (Sakaki's Iriomote cat), when Tomo finally gets what's coming to her. 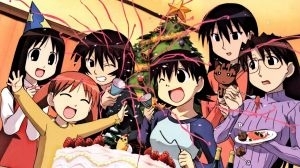 120 - Together with Mayaa Sakaki stays at Chiyo's house overnight to be with Mayaa. Meanwhile, on their way home, the other girls encounter a mean looking grey cat. 121 - Career Path Discussion The Entrance Exams are fast approaching, but Tomo still has time to ask riddles. Plus, Osaka-sensei...!?! 122 - Prayers for Acceptance The girls head to a holy shrine to pray for success on their exams. 123 - Fight The time for exams is nigh... 124 - Study Group The girls discuss how quickly three years of high school went by. 125 - Tomo and Osaka, the Fateful Day Kagura gets accepted, but is there any hope for her fellow Knuckleheads, Tomo and Osaka? 126 - First Graduation Ever The last day of school begins, Sakaki faces Kamineko, and Osaka vs. hay fever. 127 - A Thousand Emotions At the graduation ceremony, Chiyo gets a surprise, then gets overwhelmed. 128 - Sorrow Why is Miss Yukari crying? 129 - Alma Mater The girls say "goodbye" to high school. 130 - Everyone For Yomi, this is the moment of truth. Will she be accepted like the others, or will she be left out yet again?